Happy Friday everyone and thanks for taking the time to visit the Great Impressions blog. The holiday week-end is upon us. So if you are traveling stay safe. We are staying home but have plans with family and friends. It's the last holiday of summer. So whatever you are doing enjoy yourself. My card for today reminds me of summer. Little girls playing and just loving life. 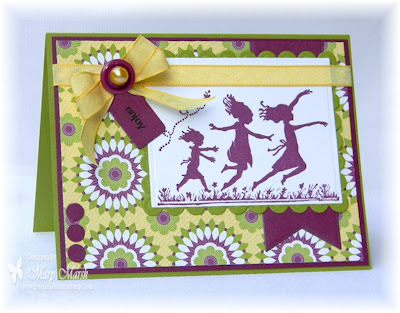 This sweet stamp is "frolicking trio" G342. 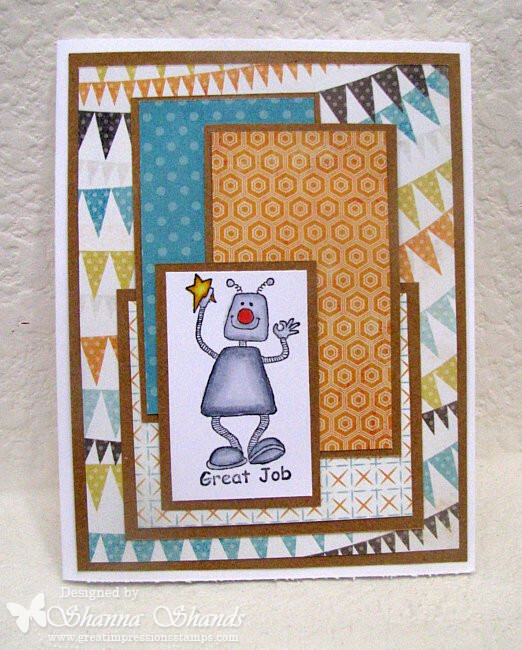 I chose my background patterned paper and built my card from there. The image is stamped in rich razzleberry ink. I used a scalloped rectangle die to layer the image. Made a seam binding bow in yellow to pick up that color from the patterned paper. I added a rich razzleberry button center and used a yellow pearl for the button center. I computer generated a sentiment and then used a mini tag to punch it out. Pennants or flags are so trendy right now so I die cut one and used it on my card. To complete my card I punched 3 small circles as a faux brad and added to left corner. Hey, Crafters! Are you making plans for Labor Day weekend? Are you planning a few days of getting inky? I know between the grilling and fishing I hope to get some time in the studio to make cards for our upcoming blog hop for the Ronald McDonald House...are YOU signed up, yet? 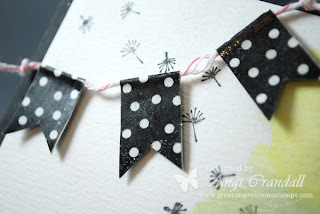 The stripes are painted onto watercolor paper using a waterbrush and Stampin' Up! inks. 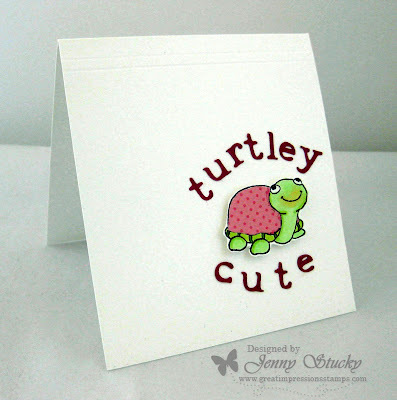 I know I've said it before, but it bears repeating: Great Impressions Stamps has wonderful versatile images and sentiments. This sentiment is actually a Thanksgiving saying, but since I only used the first 2 lines...for now it's not! 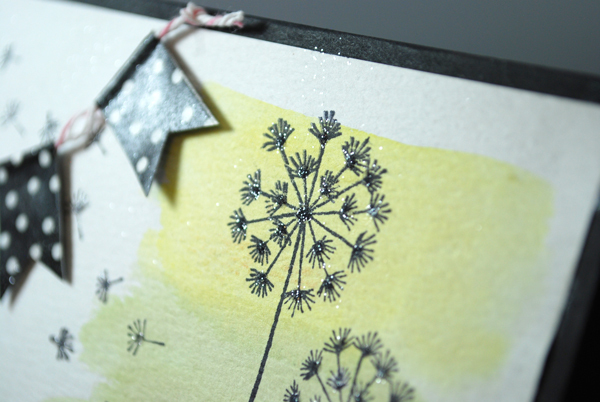 This is a lovely dandelion stamp, isn't it? beautiful stamp from Great Impressions called Scene of a rose. Sand shrink plastic on both sides then wipe off dust with a paper towel. With make up sponge or dauber tap Jade ink across shrink plastic. Underneath the Jade tap Lime ink. Set ink by lightly going over shrink plastic with heat gun. Stamp Scent of a Rose with Graphite Black ink over the Jade and Lime. Let ink dry completely. Will take 24 to 48 hours. Or you can speed up drying time by lightly heat setting with the heat gun. (Just be careful not to smear the ink and stop before plastic starts to shrink. )Punch 1/8" hole in top. Place shrink plastic on a box or phone book.&nbsp; Use heat gun to shrink. 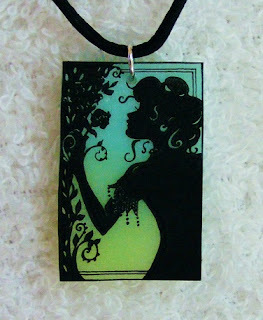 After it shrinks and while it's still hot, use a acrylic or wood block to flatten it. Attach jump ring and black cord. giving the cards and the recipients. has time to hop to each blog. 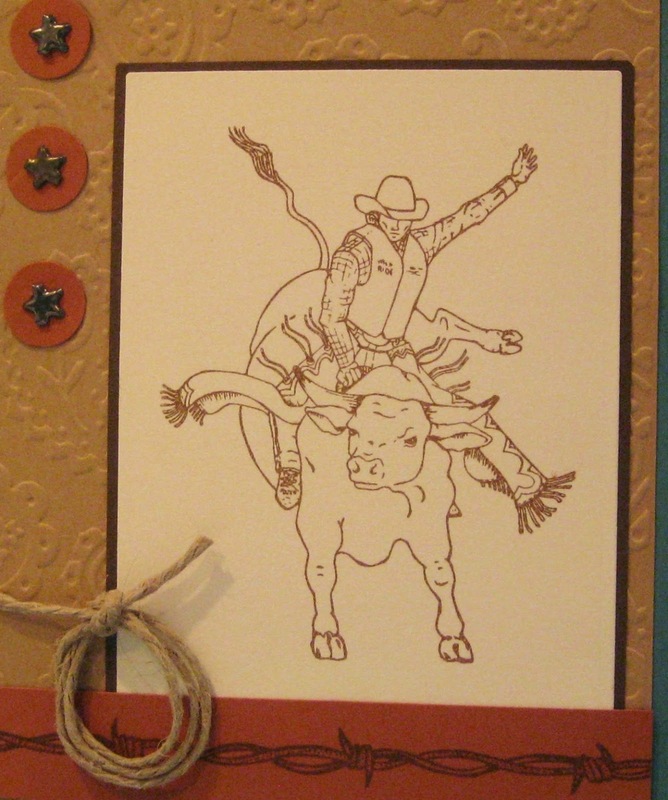 Please refrain from any type of religious connotation or get well wishes, and leave the inside of the card blank. You may layer your cards and embellish them if you like. Many of the cards will be hand-delivered, not mailed. Help us promote the blog hop by placing a badge especially made up for the hop on the top of your side bar. 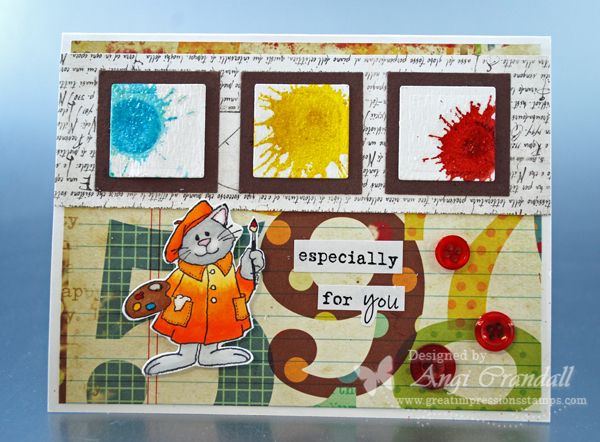 You must be a follower of the Great Impressions Stamps blog. You are required to use a Great Impressions Stamp as the focal point on your card. In appreciation from Great Impressions Stamps, participants will be e-mailed a coupon code worth 20% off your order and FREE shipping anywhere at our on-line store! Order right away so you will receive the stamps in plenty of time for the hop. Stamping prizes will be awarded to some of our hoppers and participants! your 20% off coupon code, badge, and where to send the completed cards. All cards (with an envelope) should arrive no later than Wednesday, October 10th. 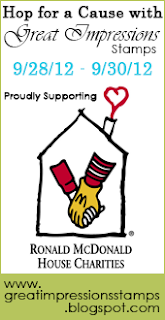 the Ronald McDonald House offices. Hello everyone. Happy Monday. Shanna here with a new card to show you for the week. Sorry for the delay in getting this post up. Had some complications with storms and internet and light for photos. I know bad Shanna!!!! 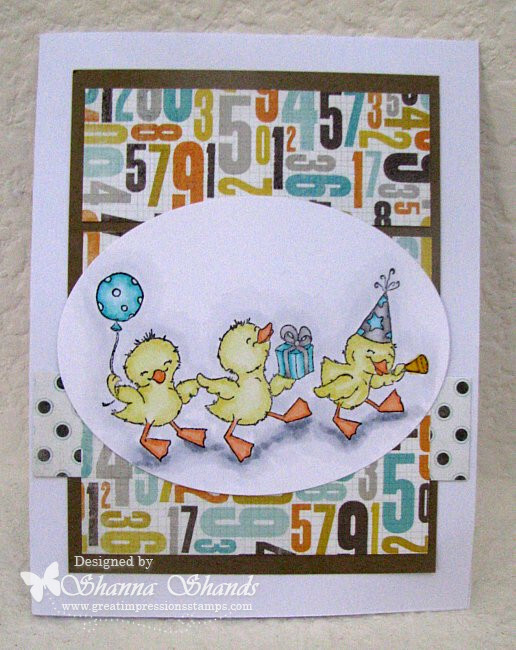 I used one of our newer stamps recently released called Party Ducks (G548). I colored the image in my all time favorite copics and then some papers from My Mind's Eye but I have no clue what the name of the paper pad is. Bad right.... It was really an off weekend for me and my brain is fried from all this lightening!!! supply and sharing that as well. will quickly pop your winnings in the mail. And...I just had to share one more summer card. It will make your heart smile! Check out the newest releases from the Great Impressions online store. This week all the little munchkins are heading back to school so we thought we would show off these fun school stamps just released. I have a little grandson and also a special little boy both starting Kindergarten in just a few days, so I made these for them! The first one is a fun little book mark! I bet my little grandson can read this sentiment too! I figured there was no sense in getting too carried away with fancy details as more than likely Cole's little bro will grab this and mangle it in no time flat LOL! You know how little one's can be! project I made is for my cute little bilingual friend just heading into kingergarten. I thought this "K" initial would be perfect for him! I bet he can read this too! It is amazing how smart these boys are already! 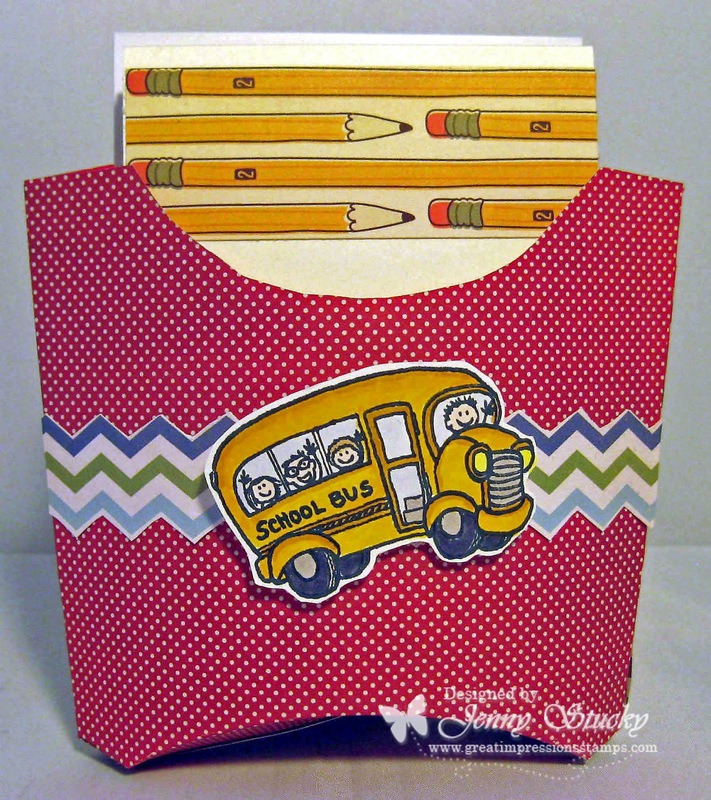 I hope you have enjoyed our school release week here at the Great Impressions Blog! Happy Friday everyone and thanks for taking the time to stop and visit. It's back to school week for us here at the Great Impressions blog. If you have been followingalong, I have a sample to show you. If this is your first visit this week, make sure you look back at the other designer's samples. You won't be disappointed. 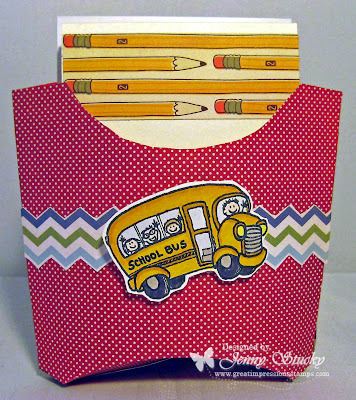 My card is using the large school bus (F505) and the circle framed alphabet(K83). I decided to create a little scene for my bus. I colored the bus with prismacolor pencils and gamsol and then cut it out. I added some glossy accents to the headlights and the tire centers. To assemble my card, I started with my cloud background. I punched a scallop circle and used it as a template and sponged around it to create the clouds. I used a die to cut my rolling hill. The trees are cut from patterned paper. I stamped the alphabet circles and used a circle punch to punch them out. I then layered my scene on my card base. Well that's it for me today. 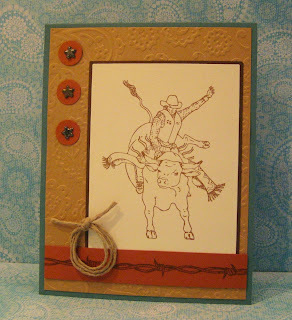 Just a reminder that Splitcoaststampers is having a virtual stamping night on September 21 & 22. It's a back to school theme. I am one of the hostesses so I hope you will play along. Get more info here. 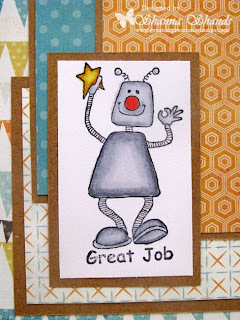 The new stamps we have been showing all week will be perfect for all the challenges. Are you just loving the stamps this week? I'm having a great time using the back to school themed ones...like this Very Creative kitty! Kitty is colored up with a few Copics. 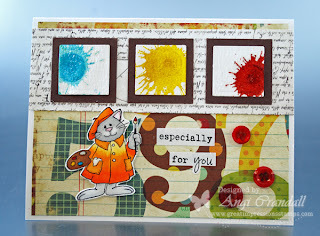 When I saw this stamp, I just knew what I was going to do...color splats with the Distress Stains! Open the bottle and SMACK the dauber on your project...really...that's it! Practice on a tag. 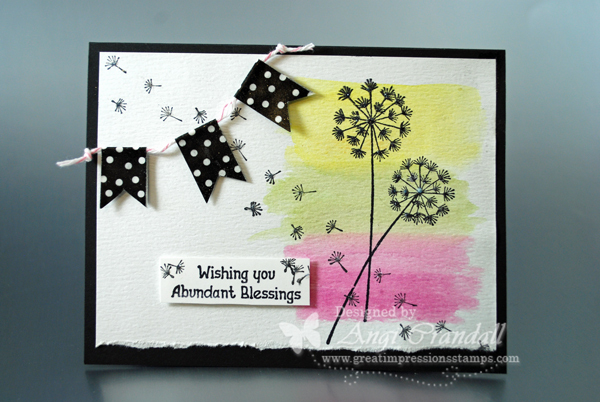 If you don't really like the results, spray it with some Perfect Pearls mist - makes wonderful backgrounds! I added some clear embossing powder over the paint bits on the palette and the splats for some shine and texture and a computer generated sentiment. I hope YOU find some 'di-stressing' time this week! 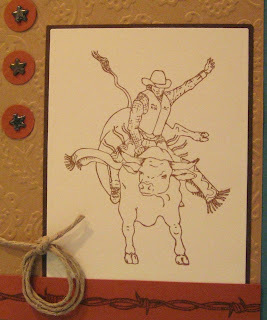 Here's a invitation I designed for a little boy's "Cowboy theme"
Birthday party using two stamps from the new release. Today I want to show you just how versatile Great Impressions Stamps can be. body and paper piecing it instead. So my first Cricut project ever...is my sentiment. over at Splitcoast for Virtual Stamp Night? our teacher stamps so you can participate! How is everyone this fine Monday. Are you excited for release week to get on a roll and see some new stamps? This week we have a new addition of stamps available in-store and great for going back to school themes and teacher projects or even just to have to give your kid a stamp for doing great. For cardstock I used an older My Mind's Eye paper pad that was boyish. I colored the stamps with copics and used kraft cardstock for the base color to go along with the feel of the card. I kept it really simple for you for our release we have going on. 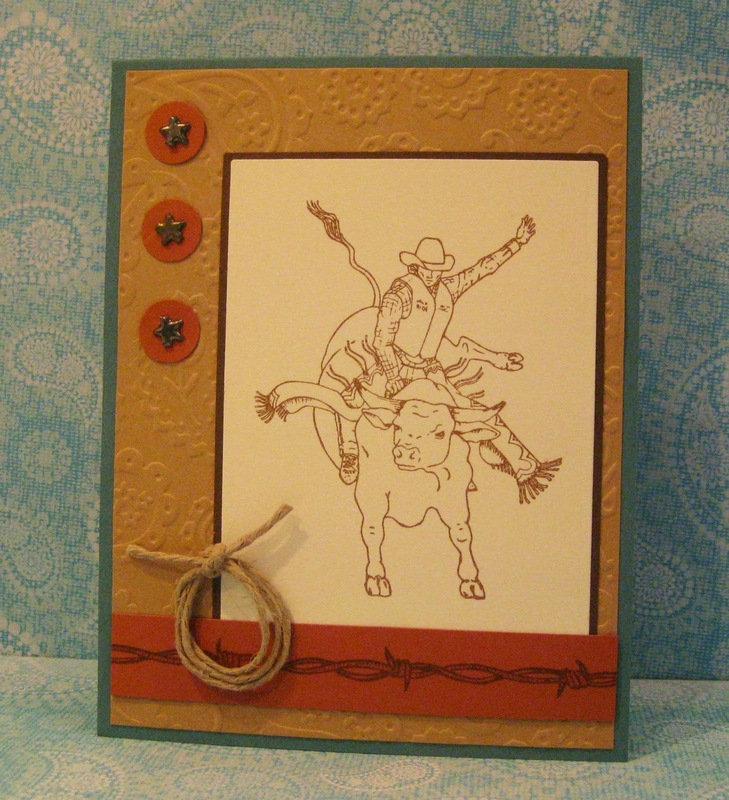 Come back tomorrow to check out another new stamp from Great Impressions newest collection. here at Great Impressions Stamps! I'm starting off with our winners from Release Week! Congrats to the following ladies! at Great Impressions Stamps! 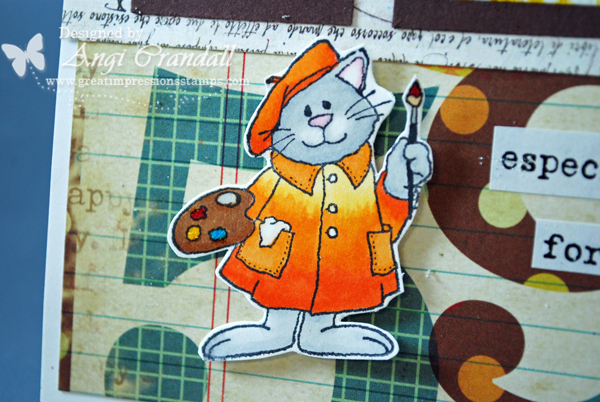 We hope you enjoyed our newest stamps as much as we enjoyed creating a little something for you! It's back to school week here at Great Impressions Stamps! Isn't this school bus a hoot? If my card holder looks a little familiar...it should. to give her teacher on the first day. for her to use as she pleases. Each is decorated with a school theme. teacher stamps to share with you. give to a teacher as is... for her or him to create with. So if you like what you see this week leave us a comment. You could find a stamp delivery in your mailbox. we celebrate Back to School!